Looking at where we are today as we strive to make Dr. Martin Luther King, Jr.’s Dream a reality, the progress clearly needs to be sped up and intensified. Narconon Professional Drug Prevention has enlisted The Positive Art of Hip Hop to unleash the energy and creativity of youth to battle an increasingly toxic environment that plagues families already oppressed by injustice and oppression. A decade or so ago, a new phrase entered our language. Children were described as “at-risk youth.” The term referred to students who were at risk of dropping out of schools, succumbing to drugs and/or gangs. It still means that, but today, it is a far greater percentage of youth who fall in this category because of the abundance of drugs, both legal and illegal, the ease of access to drugs, including from medicine cabinets, and the ambivalence that has been expressed regarding the harm that drugs can factually do. The MLK Anti Drug Kick-Off Event on December 18th enlisted Urban Artists to use their art to help remove the influence of drugs from our communities. The event held at Crewest Gallery, and hosted by well-known LA Urban Artist, Man One, was sponsored by Narconon Professional Drug Prevention, the National Alliance of Faith and Justice and Narconon Western United States. The winning anti-drug piece was created by Jose Quevedo, a 23-year-old LA urban artist. It will be converted to an original tee and worn by participants in the Kingdom Day Parade, 17th Jan. 2011, to draw attention to the potential of youth art and creativity to overcome the undermining influence of drugs. Grand Prize:$200 and his “Drugs Ruin Creativity” graff piece will be featured in the Kingdom Day 2011 parade. 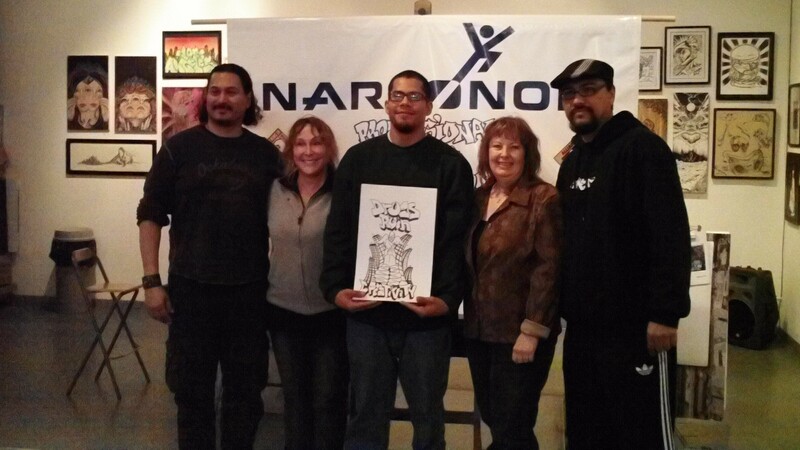 (left) Gino Montesinos, writer and actor (judge), Heidi Lemmon, President National Skateboard Association (judge), Jose Quevedo, Grand Prize Winner, Teddy Chambers, Exec. Dir. Narconon Professional Drug Prevention, Man One, owner Crewest Gallery (judge). To see more pictures from the kick-off, click here. This entry was posted on Sunday, December 19th, 2010 at 10:03 pm	and is filed under Drug Prevention, The Positive Art of Hip Hop. You can follow any responses to this entry through the RSS 2.0 feed. Both comments and pings are currently closed.